What a weekend of track and field, once again New Jersey stepping up to provide us with amazing performances and valiant team efforts. We gathered all of our leading relay times and marks from the NJSIAA meets and now you decide which was the most impressive between them. The polls will close Thursday at 11:59pm! Photo Albums from Every Meet! 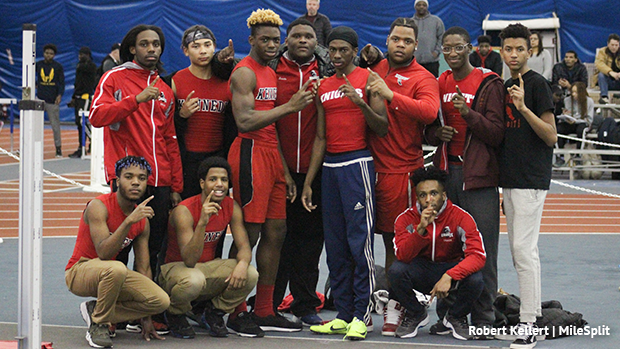 The J F Kennedy Paterson high jump boys and their teammates after their big win on Friday evening. Jadon Watson cleared 6-08 to tie NJ#1 US#7 and his teammate Jamier Wright made it over 5-10.